One of Saarinen's earliest works to receive international acclaim is the Crow Island School in Winnetka, Illinois (1940). The first major work by Saarinen, in collaboration with his father, was the General Motors Technical Center in Warren, Michigan. It follows the rationalist design Miesian style: incorporating steel and glass, but with the added accent of panels in two shades of blue. The GM technical center was constructed in 1956, with Saarinen using models. These models allowed him to share his ideas with others, and gather input from other professionals. With the success of the scheme, Saarinen was then invited by other major American corporations to design their new headquarters: these included John Deere, IBM, and CBS. Despite their rationality, however, the interiors usually contained more dramatic sweeping staircases, as well as furniture designed by Saarinen, such as the Pedestal Series. In the 1950s he began to receive more commissions from American universities for campus designs and individual buildings; these include the Noyes dormitory at Vassar, as well as an ice rink, Ingalls Rink, and Ezra Stiles College at Yale University. He served on the jury for the Sydney Opera House commission and was crucial in the selection of the now internationally known design by Jørn Utzon. Eero Saarinen and Associates was Saarinen's architectural firm; he was the principal partner from 1950 until his death in 1961. The firm was initially known as "Saarinen, Swansen and Associates", headed by Eliel Saarinen and Robert Swansen from the late 1930s until Eliel's death in 1950. The firm was located in Bloomfield Hills, Michigan until 1961 when the practice was moved to Hamden, Connecticut. Under Eero Saarinen, the firm carried out many of its most important works, including the Jefferson National Expansion Memorial (Gateway Arch) in St. Louis, Missouri, the Miller House in Columbus, Indiana, the TWA Flight Center at John F. Kennedy International Airport that he worked on with Charles J. Parise, and the main terminal of Dulles International Airport near Washington, D.C.. Many of these projects use catenary curves in their structural designs. One of the best-known thin-shell concrete structures in America is the Kresge Auditorium (MIT), which was designed by Saarinen. Another thin-shell structure that he created is the Ingalls Rink (Yale University), which has suspension cables connected to a single concrete backbone and is nicknamed "the whale." Undoubtedly, his most famous work is the TWA Flight Center, which represents the culmination of his previous designs and demonstrates his expressionism and the technical marvel in concrete shells. aarinen died while undergoing an operation for a brain tumor at the age of 51. His wife, Aline, coincidentally, would also die of the same ailment. His partners, Kevin Roche and John Dinkeloo, completed his ten remaining projects, including the St. Louis Arch. Afterwards, the name of the firm was changed to "Kevin Roche, John Dinkeloo, and Associates", or Roche-Dinkeloo. 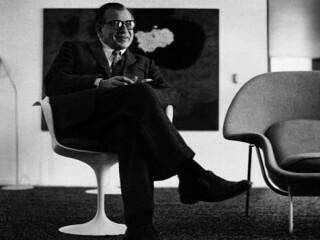 View the full website biography of Eero Saarinen.